The Kensington Community Food Co-op needs 800 members by the end of 2014. | Rendering by MAKE. Singer’s reaction was welcome news to KCFC board members and volunteers. KCFC’s multi-year search for a location came to an end last summer when they targeted the shuttered O’Reilly’s Pub at 2672 Coral St. 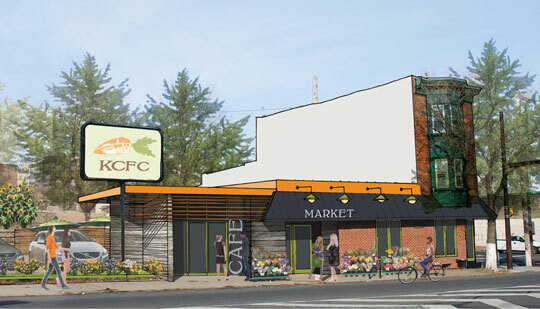 The 4,200-square foot first floor and 1,110-square foot basement fit the spatial needs of KCFC’s feasibility study, and its location—just a half-block from Frankford Avenue —was ideal. But the bigger selling points were the patio area, the 18-car parking lot, and the liquor license that was attached to the building. Once the store opens, the 30-seat café will sell prepared food and local and regional craft beer that members will be able to enjoy at the space or take home. But with every moving piece seeming to align perfectly for the KCFC board, the whole deal still almost fell through. As director-at-large Jeff Carpineta says, “During that time, the building was heavily vandalized, and a New Jersey bank foreclosed on the property. The co-op was in no position to buy the building and needed an angel [investor] to close the deal, and then two came.” Mike and Sue Wade, who had roots in the neighborhood, purchased the site, giving the co-op a generous lease with an option to purchase. According to a 2008 census, Kensington has a population of 21,635. As new development has boomed in the past six years, bringing in many more new residents like Singer, there are still only two major grocery stores serving the neighborhood’s boundaries. So, a community based solution to this lack of food access certainly appealed to longtime residents like the Wades, and their newer neighbors. For more information on membership, visit kcfc.coop/membership or email info@kcfc.coop.